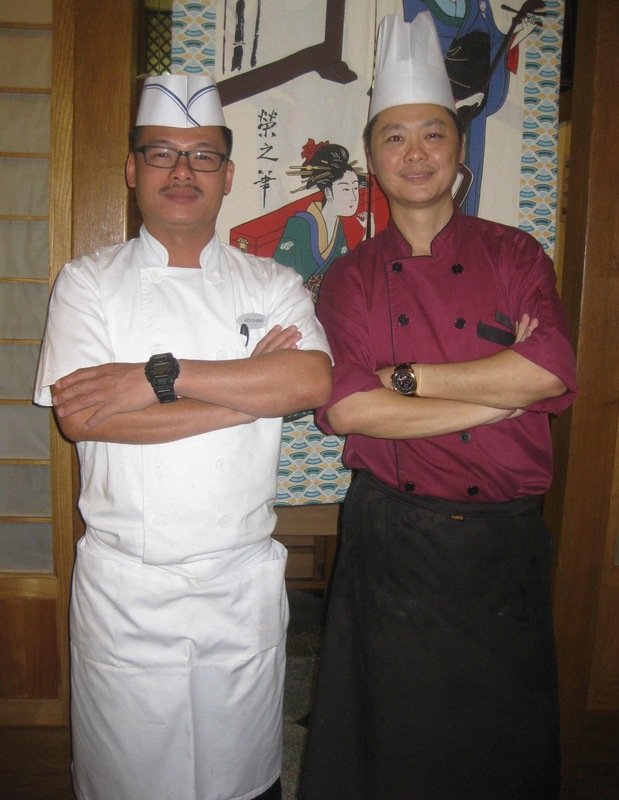 ﻿Chef Ken Chong of Sobasei Japanese Restaurant and Chef Andy Liaw of Xin-Shan Long Chinese Restaurant have got together to create the best of the East cuisine in their two-in-one restaurant. 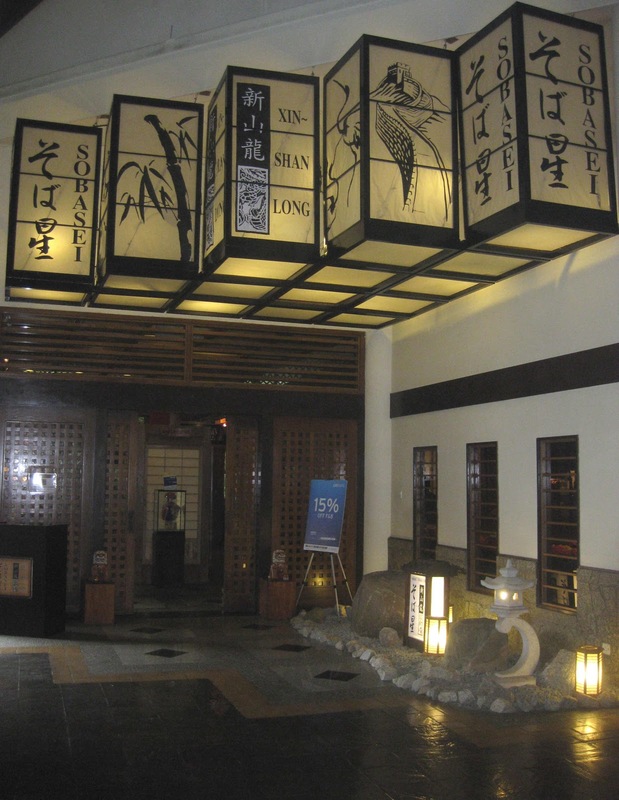 Sobasei, reputed as one of the best Japanese restaurants in the city, is now partnering with Xin-Shan Long, “the dragon of Johor Baru,” to offer guests a choice of savouring either a Chinese or Japanese menu or their favourite choices from both menus. Helpful service staffs, clad in smart kimono and cheong sam, are also on hand to help you in picking an interesting combination from two a la carte menus for a memorable meal. Your guests will be impressed to begin with a refreshing appetizer of Sushi and Sashimi Moriawase made up of slivers of fresh tuna, salmon and prawn, artfully arranged on a colourful bed of Japanese julienne salad. This can be followed by a delicious Seafood Pumpkin cream soup that is topped with a chopped scallop and filled with just the right amount of juicy seafood shreds. 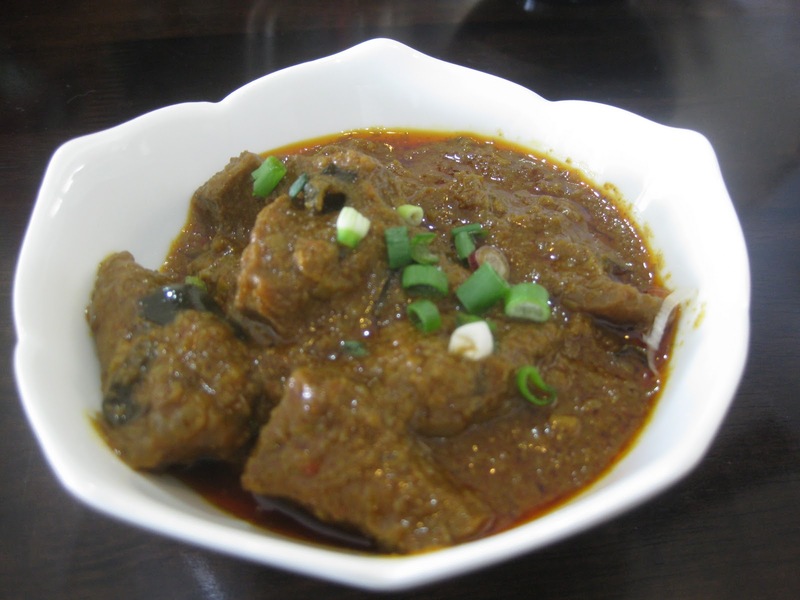 Two popular main course dishes are stir-fried Chicken Dried Chilli and deep-fried Cod Fillet. This agreeable chicken flavour is reminiscent of Kung Po Chicken and the tender meat is neatly presented on a slice of crispy bun or mantou. 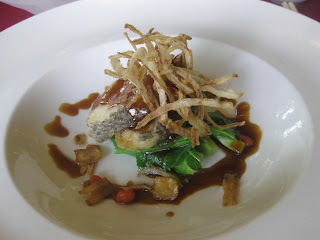 The fillet of smooth and fragrant cod fish is served on a bed of baby Kailan greens and drizzled with Teriyaki sauce. Noodles will be a pleasant change from rice so try Tenzaru Noodles, served in a warm bowl of soup with a side of Teppanyaki prawn and oyster mushroom. Then end the meal with dessert created with a slice of Crispy Pancake, filled with a spread of sweet lotus paste, served with a scoop of vanilla ice-cream and topped with mixed fruit cocktail. Here, you can choose to drink either Chinese tea or Japanese green tea with your meal. While the individual portions may appear small, this menu is a good mix of Japanese and Chinese specialties that will certainly satisfy discerning palates. Gardeners say that talking to your plants will make them grow but at Desaru Fruit Farm, visitors learn that plants not only need some persuasion to bear fruit, they should also be stressed. Henry Goh, the Farm General Manager, explained that fruit trees reluctant to bear fruit, will get its trunk whacked with a few strokes of the parang while persuasive words are whispered to stimulate it to flower and fruit. His larger-than-life persona and tri-lingual spiel, sprinkled with fascinating anecdotes and colloquial humour, held visitors’ rapt attention as they toured the farm with him. City-slickers may enjoy wide varieties of tropical fruits but many haven’t the foggiest idea about how its tree or the uncut fruit looked like. If they are only used to seeing fruits in the supermarkets or on fruit platters, this will soon change as Goh takes them on a walk between fruit trees to look at fruits that are still on the trees. With a strictly “No Picking” rule, visitors are welcome to see, smell, touch and feel the fruits while Goh selects ripe fruits and offers them, freshly cut for everyone to sample the juicy flavours under the trees. When bunches of pulasan are offered, visitors are shown how to twist its thick, dark-red skins off to reach the juicy fruits inside. Guided around the farm, visitors get to sample fruits ranging from kedondong, guava, dragon fruit, passion fruit, custard apple and mango to an interesting variety of jambu like the round Jambu Mawar, Jambu Rose, Jambu King and Jambu Madu. 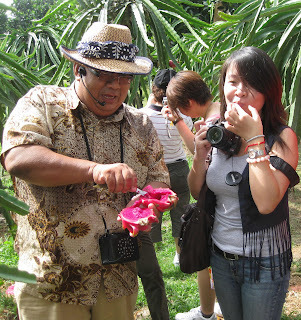 Pointing to breadfruit or sukun on the tree, Goh assures visitors that they can have a taste of it, deliciously deep-fried, in the farm’s fruit buffet. 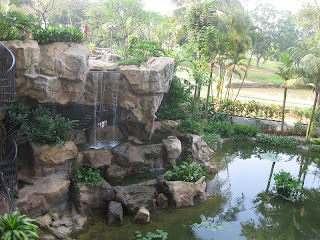 The farm often hosts visits with schoolchildren, corporate groups, families and foreign tourists and is also a favourite destination for most visitors to the Desaru resort district. As visitors tour the well-organized farm, little do they know that this award-winning farm started in the early 90’s as a humble fruit stall along the Desaru main road. 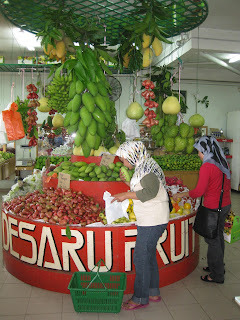 Visitors to Desaru would inevitably stop to buy fruits from this stall and it was such a popular stopover that cars parked haphazardly next to it became a potential traffic hazard. When the authorities advised the fruit stall to move into the safety of the adjacent land, this fruit business gradually developed into the Desaru Fruit Farm. Since the farm opened its doors to visitors in 2001, its popularity increased by leaps and bounds and soon established itself as one of the nation’s largest Agro Tourism sites. 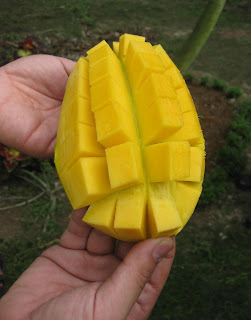 Sprawled across 100 acres of land cultivated with more than 10 species of plants and more than 100 varieties of tropical seasonal and non-seasonal fruits, the farm operates with Good Agricultural Practice or GAP, to increase yields with a systematic organic and non-chemical fertilizer programme. Visitors will notice a distinct absence of mosquitoes and irritating insects as they walk around because the farm is kept comfortably pest-free with a good drainage system, an intercropping system and the Integrated Pest Management [IPM] method. To protect against fruit flies, rotten fruits that dropped under the trees are consistently cleared away to process into organic compost. Goh said pruning bushy plants not only helps to enhance air circulation and protect against algae infection, it also encourages crosswind pollination. In addition to fruit trees, the farm also has an Herb and Vegetable Garden located next to a fish pond teeming with some 1881 ornamental koi fish. Here, visitors can pause at the Fresh Fruit Station for a refreshing drink of chilled fruit juices and visit the adjacent Agriculture Gallery to see a collection of ancient farming implements and artifacts. 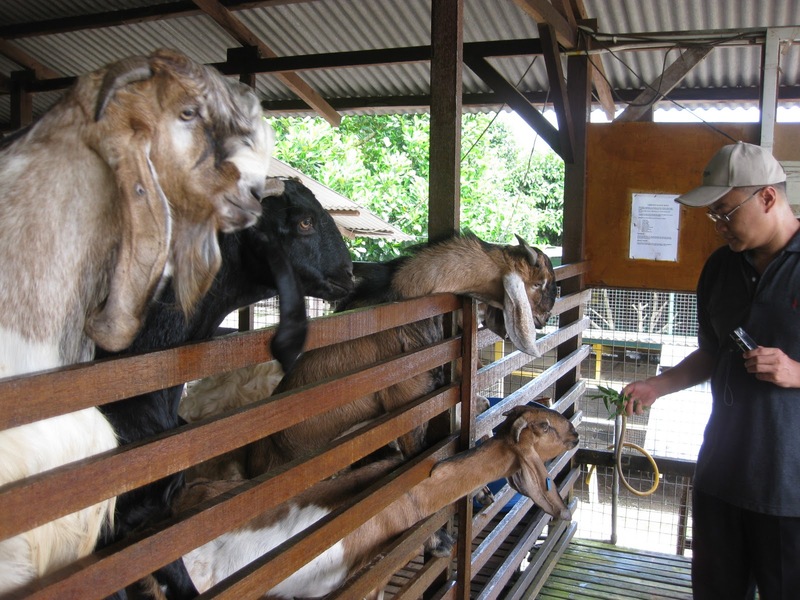 A nearby petting zoo allows visitors to enjoy a hands-on experience with cuddly chicks and bunnies before they feed the goats in the nearby barn. It’s interesting to learn that goats are such sensitive creatures that they refuse to taste another goat’s saliva. When feeding a goat, Goh said that you should give the whole vegetable stalk instead of holding a bunch of vegetables to let it chew a chunk off. If the half-bitten bunch of vegetables was offered to another goat, it will be wasted because the goat would only sniff but refuse to take a bite! The goats are also employed as natural grass-cutters because they graze around the farm and help to maintain the grass at neatly trimmed lengths. Goats are bred for meat and its dung is processed to produce Organic Bio Fertilizer [OBF]. OBF is made with pure organic materials specially blended with Effective Micro-organisms [EM] and used in the farm to enhance sustainable agriculture and improve the quality of the environment. A fitting end to this entertaining and educational Farm Tour is to enjoy a refreshing and mouth-watering, all-you-can-eat fruit buffet. 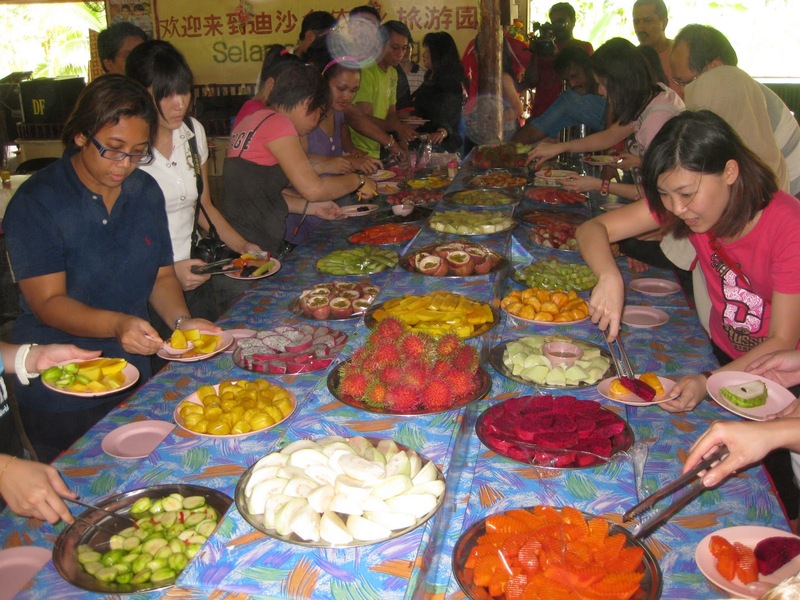 At any time of day, visitors can opt for the Farm Specialty tour that offers a buffet of more than 12 types of fresh and pickled fruits. “The best way to enjoy your meal is to begin with fruits and end it with fruits,” advised the affable Goh as he invited visitors to enjoy the generous buffet lunch spread that included separate stations for freshly-made fruit juices, fried fruits, kampong lunch and traditional desserts and kueh made with farm-grown fruits and vegetables. A visit to the Farm is not complete without shopping for fresh fruits at the Souvenir Shop to enjoy at home and share with others. The Farm is the proud recipient of a host of Ministry of Agriculture national level awards including the Special Award MAHA, Agro-tourism category in 2006 and first Runner-up in Farmer’s Day Best Farm contest 2001. It is open daily from 9.00am to 6.00pm and advance group reservations for tours and meals are recommended. In 1930 when grandfather, Goh Hin, arrived in Kluang from Hainan Island, he started selling beef noodles from a stall in the old market along Jalan Pasar. Known as Tian Le Yuan beef noodles, this thriving business was a magnet for beef noodle connoisseurs who came from as far away as Singapore, to enjoy the tasty treat. 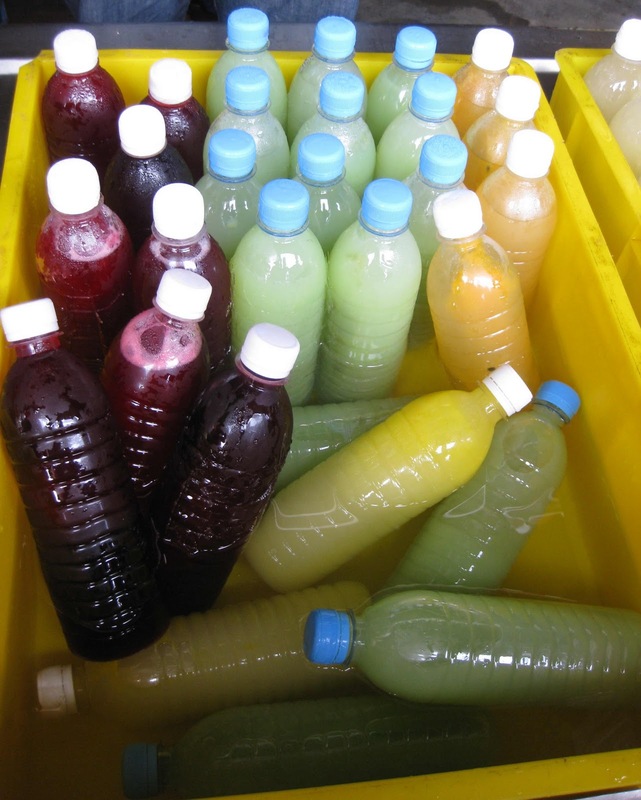 As he advanced in age, this father of seven gradually handed over the business to his three sons who went on to set up separate businesses under their own names. 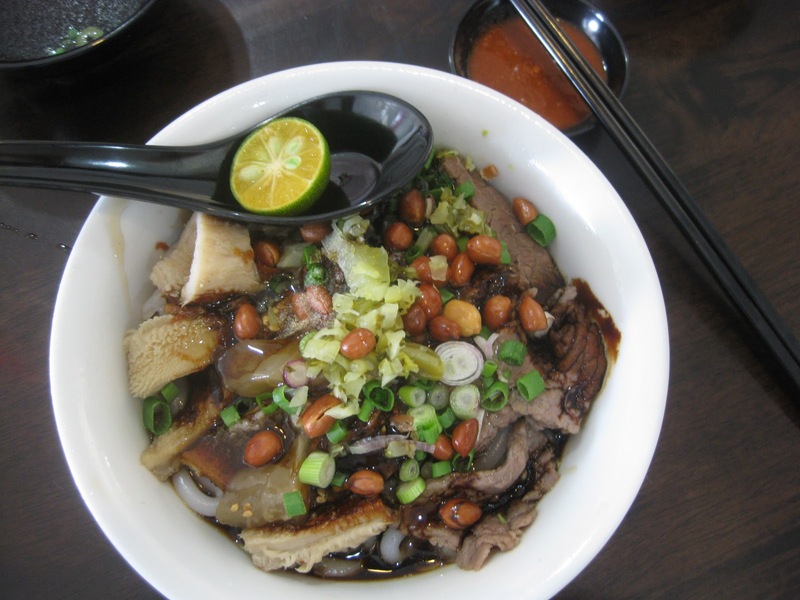 In 1975, his youngest son, Goh Kee Loon, started trading as Yean Kee beef noodles at Jalan Kapten Ahmad and remained so popular among regulars that they followed his trail when the stall moved to Jalan Panggung in 1982. Just as he was trained by his father from young, his son Goh Chuan Kian, also started learning the trade as a youth and helped in the stall after school. Now in the third generation, Goh Chuan Kian and his wife, has taken the traditional family business to new heights with an updated business concept in their shop at Taman Murni, Kluang. After a facelift last May, their shop started to attract a younger clientele who appreciate the clean, cool colours and modern concept in the café-like eatery. While most regulars will still order their signature beef noodles topped with cuts of beef, omasum, tripe and tendons, flavoured with chopped salted vegetables, crunchy peanuts, sesame seeds and secret sauces, there is now a menu to pick from a choice of noodles and side dishes and drinks. “At first, the old-timers complained,” said Cheong Sit Li, Goh’s wife, because they preferred the traditional layout of the shop but she was glad that they still kept coming back for the noodles. She realizes that regulars simply enjoy the traditional recipe in the preparation of the herbal soup and special sauces used with the beef noodles. 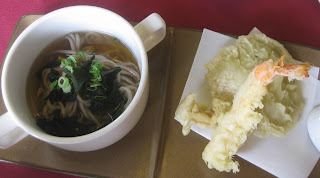 In fact, their smooth rice noodles are homemade in a family recipe that was passed down through the generations. Using a combination of manual skills and some automation in the noodle preparation, Goh said his father still helps him and his wife with this. The process starts from about 6am and in about one and a half hours the noodles are ready, freshly made for the stall to open at 10am. “We have to change with the times and keep up in business innovation,” said Goh who grew up observing how his father and grandfather worked hard to build the business. 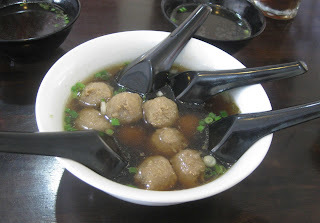 In addition to beef noodles, Yean Kee now also serves beef ball and fish ball noodles, beef rendang with rice or noodles, and freshly sliced tender beef noodles in a dry choice or in beefy broth. Yean Kee is located at No. 4, Jalan Murni 1, Taman Murni, 86000 Kluang, Johor. Business hours on Saturday, Sunday and public holidays are from 10am to 9pm. 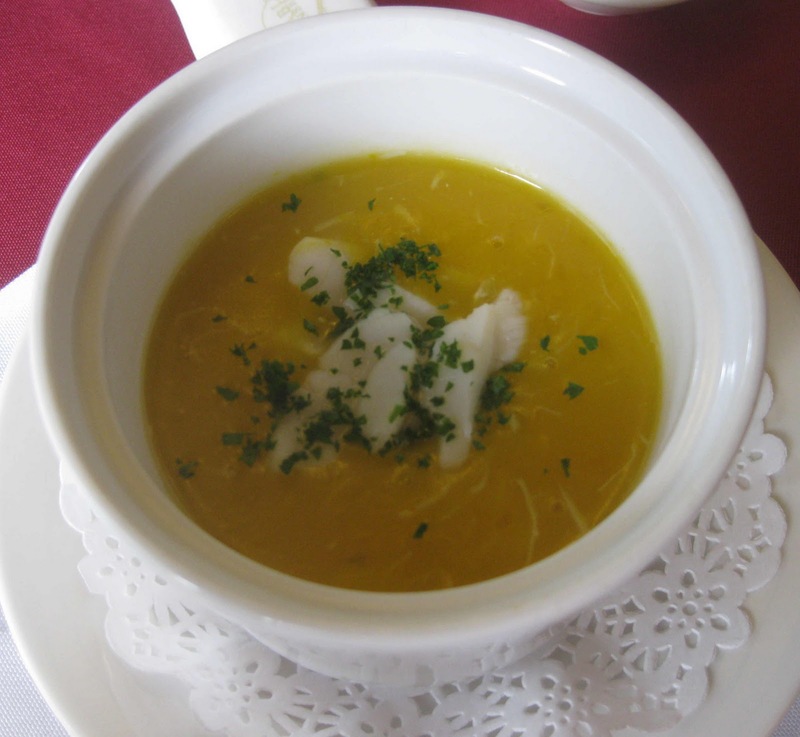 On weekdays the hours are from 10am to 3pm for lunch and from 6pm to 9pm for dinner. They are closed on Monday and Tuesday on alternate weeks. Tel: 012 – 7733 088. 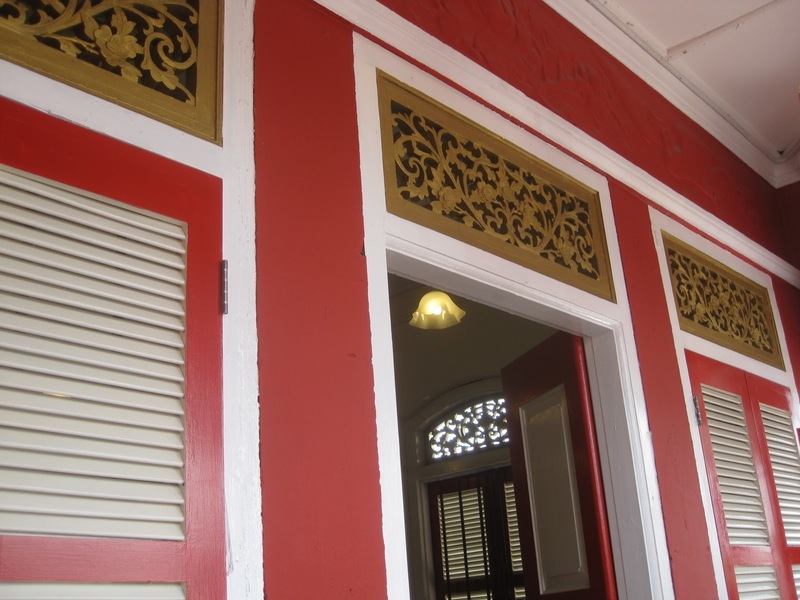 If you are at Tan Hiok Nee Cultural Street, you cannot miss that corner shophouse which was recently repainted in bright red with contrasting white highlights. Even while renovations were on, No. 56 attracted curious enquires from many who wondered what it housed and who it belonged to because it certainly looked posh enough to be a private property. When works were completed in June 2011, the façade of this building served as an impressive backdrop for several successful cultural events on this street. This 19th Century building was originally owned by an Indian family and changed hands several times before its present owner decided to restore it to its former glory. 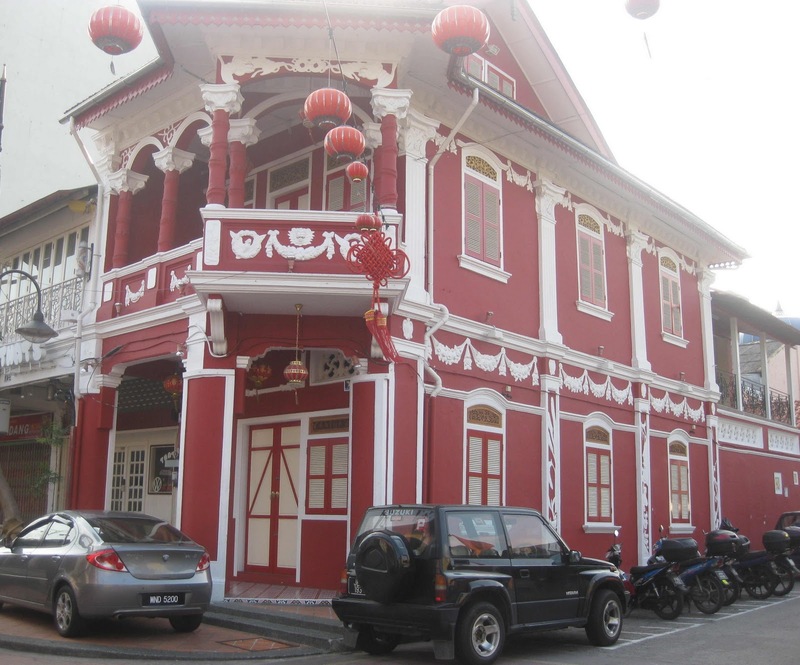 While Jalan Tan Hiok Nee was declared a heritage street in October 2009, the owner had the passion and foresight to preserve this pre-war shop-house as a heritage building. The historical value of this building is priceless as it is a portal into the rich and unique history of Johor Baru. During the 8th Johor Baru Arts Festival in July 2011 some events were jointly organized with the Tan Hiok Nee Heritage Walk Committee and held at various venues on this street. Throughout the Fest, arts enthusiasts thronged the area and had a glimpse of this remarkable building which inevitably earned its moniker – The Red House. Finally on 23 July, a selected few had the privilege to attend a by-invitation movie event held here. It was an enchanted evening because the nostalgic ambience of this beautiful building was the perfect place for the screening of the award-winning movie, “Love is a Many Splendoured Thing.” This movie classic, based on a novel written by Han Suyin, is believed to be her autobiography. Han Suyin was the pen-name of Dr Elizabeth Comber, a Eurasian doctor who spent about 10 years in Johor Baru, working in a dispensary located above the former Universal Pharmacy at No. 24 Jalan Ibrahim. This row of shops on a parallel road just a stone’s throw away from the Red House was however, destroyed by fire in 1982. 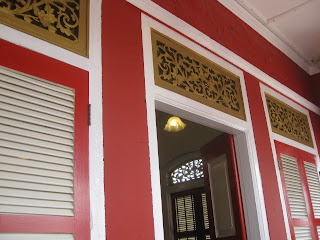 In August 2011, the Red House was leased to the Tan Hiok Nee Heritage Walk Committee who has plans to host various cultural events here and bring more excitement into the heart of old Johor Baru. An event on 21 August, dubbed Red Wine @ Red House was a wine appreciation evening where some wine connoisseurs learnt the finer points of appreciating red and white wines and the art of reading labels on wine bottles from Sylviane Siah of S & L Vintners. From 10 September a Photography Exhibition by Dato Dr Siow Kuang Ling will be presented at the Red House for two weeks. 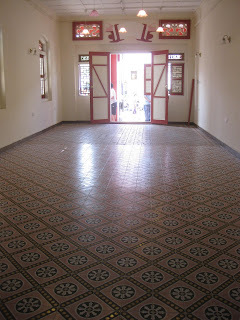 Very similar floor tile design, I saw in the Assembly Hall of Cantonese people at Hoi An heritage town in Vietnam! From the bright green of the staff’s T-shirts to the lush greenery in potted plants and landscaped gardens, I was seeing the colour green echoing consistently throughout the lobby. With my eyes riveted to the stalk of greenery entwined in the design of the resort’s name, I thought that the curly green tendrils resemble pucuk paku or wild fern shoots. I find this welcome sight both interesting and refreshing as I step into the reception lobby from the blazing sunshine. The spacious and airy reception area is busy with a group checking in for a retreat stay. 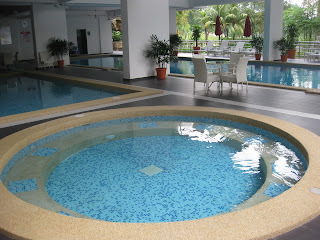 I later learnt that the resort is a popular choice among corporations and groups for meetings and family outings. Its pillar-less convention hall is also a preferred destination for conferences and banquets. This venue is fast gaining popularity for wedding banquets because meals are catered by experienced chefs of the Grand Straits Garden restaurant. 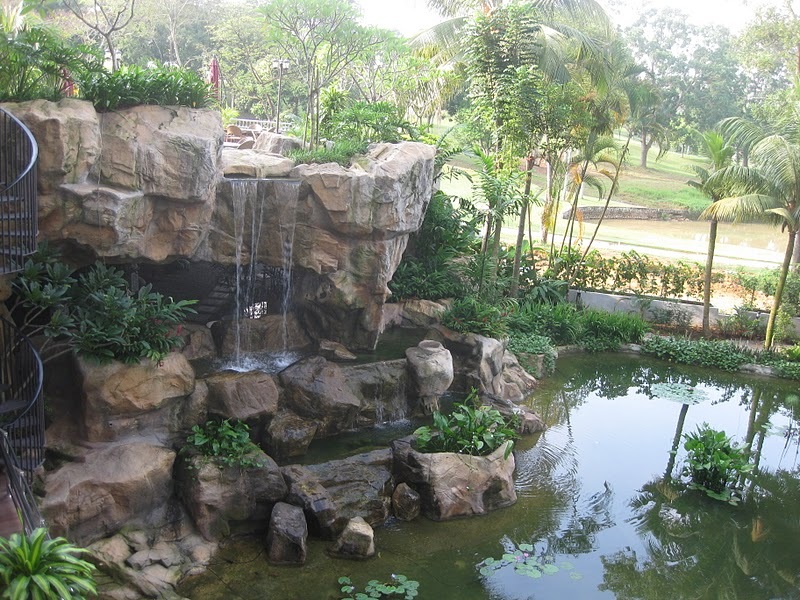 Residents and guests enjoy working out in the fitness centre that overlooks a landscaped garden designed with a rocky waterfall that splashes into a water lily pond. As I walk down the spiral staircase, I spy colourful koi fish in the pond. Swimming enthusiasts may not be keen with over exposure in our tropical heat and strong sunlight but that’s not going to happen here because the swimming pools are sheltered. There’s just enough light from the sun into that open terrace to make swimming in the lap pool and playing in the children’s pool or soaking in the Jacuzzi, so much fun at any time of day! Shaded pools to cool off in! With a variety of rooms in studio and standard designs as well as three and four-room apartments for a convenient and comfortable homey stay, the resort perfectly complements events that require group accommodation. These well-appointed furnished apartments, in single-storey Sinplex and double-storey Duplex designs are ideal for long-staying guests. When I pull back the curtains in my room, there is a tiny balcony for me to step out to enjoy a green view of the golf course. It was good to lay back on a clean and comfortable bed with a 32-inch LCD TV screen in front and a choice of satellite television channels to choose from while working with 24-hour free internet service. In the bathroom, the clever use of mirrors that span almost the whole length of the long and narrow space gave me the impression of a much larger room. I’m told that breakfast is best savoured on the terrace that has a panoramic view of greenery on the fringe of the adjacent golf course. So I join the residents and guests for breakfast there and experience a rare view of wispy mists gently evaporating in the morning sunshine. While the others leave for work and business at the nearby industrial zones, I sit back comfortably to slowly sip a second cup of coffee. 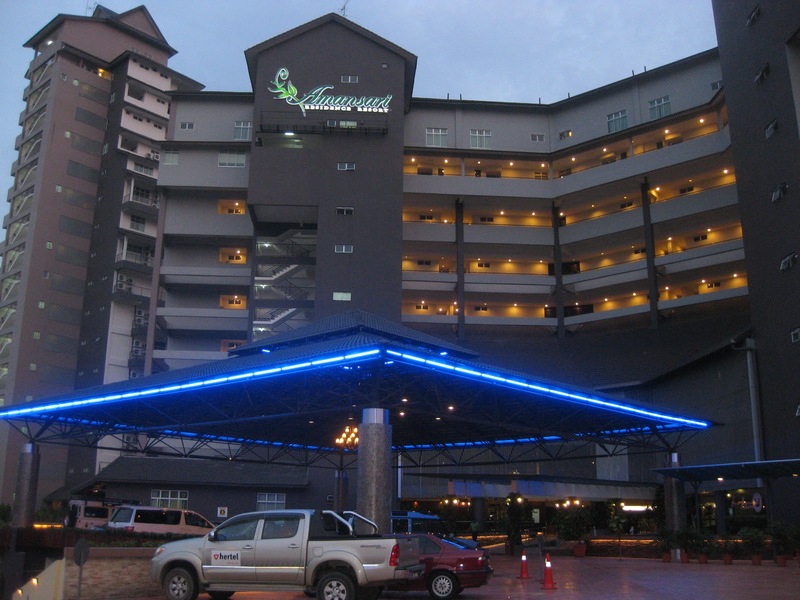 Easily accessible from the Pasir Gudang Highway, the main road that connects to the North-South Highway from the North and Johor Baru city and Causeway from Singapore. Exit left at the Seri Alam Interchange and the resort is to your right, so make a U-turn to reach the resort entrance. A restful retreat with convenient access to adjacent golf course and located a comfortable distance away from the busy-ness of Johor Port and nearby industrial estates. A peaceful haven so close to the industrial zone! Total 292 studio and standard modular rooms, 32 units of 3-bedroom Sinplex apartments and 58 units of 3-bedroom Duplex apartments. Ask for special promotional rates and long-term stay rates for Sinplex and Duplex apartments. Housekeeping and cooking facilities are available upon request. The Courtyard Café offers all-day dining in both air-conditioned comfort and an outdoor section. In the evening, the lounge serves drinks and snacks. 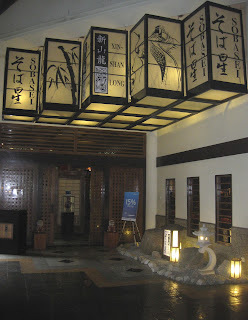 Gozen Japanese Restaurant serves a selection of authentic Japanese cuisine. The Grand Straits Garden Restaurant offers an ala carte menu of Chinese favourites and caters to special events and banquet requirements. Convenient high-speed internet access is available Free-of-Charge, a Business Centre, convention hall/ballroom and meeting rooms, indoor swimming pool, squash court, tennis court and a fitness centre. Guest shops with hairdresser, beauty parlour and a convenience store. Concierge services include transport arrangements and tour bookings to places of interest in Johor and Singapore. UPDATE: The resort is currently undergoing stage-by-stage upgrading. So look out for an updated review of the resort in the near future! I started visiting Aw Pottery in Macap almost 40 years ago, usually en route to spend the weekend with Uncle Steven and Auntie Polly who lived in a farm located between Air Hitam and Kluang at that time. The journey was a leisurely drive on the scenic route from Johor Baru to Air Hitam, often with a stop in Macap to see what was new in the pottery showroom. It was easy to spot the entrance to the showroom because it was marked by two giant figures that resembled a couple performing a Malay cultural dance, designed with a glossy mosaic covering of ceramic chips. The distinct rough and rustic beauty of handcrafted Aw pottery has a special appeal to fans of ceramic-ware. The founder and sculptor, Aw Eng Kwang, an immigrant from Teochew province in China, had the foresight to expand his market abroad to the United States of America and products from their pottery plants in Ru Yang, Chaoan and Guandong in China were exported for distribution in warehouses in Seattle, Atlanta and San Francisco. The small plant and showroom in Johor was a local tourist attraction and I often brought visitors there not only to see Aw’s artistic creations displayed in the Aw Museum but also to experience their uniquely designed restrooms. I remember being fascinated by the colours in the interesting restrooms where the walls were creatively decorated by ceramic-ware. Small bowls and plates were cleverly arranged in interesting 3-D mosaic designs to create big and small flowers and there were also a figure of a man and a lady that each pointed to the Men’s and Ladies’ rooms. The colourful mosaic designs outside continued inside into the restrooms and I was so enthralled that I could not resist photographing them from all angles. Ceramic-ware in the Macap plant was first produced using a traditional wood-fire kiln that was nicknamed, the “Dragon,” because of its structure. Sprawled across a wide atrium in the rear, this brick-walled kiln measured 50 meters long, 4 meters wide and 2 meters high, and had two side entrances. When it was fired-up, Aw and his team of workers worked 24-hour shifts in a carefully timed week-long cycle to prepare the “green” products, stack them inside the kiln, smoke them and maintain the fire before allowing the kiln to cool down. After more than 30 years of spewing smoke and fire, the Dragon retired in 1982 and its dormant frame became a museum showpiece. In 2004, I had the privilege to go into the cavernous Dragon kiln for a glimpse of the interior that was still stacked with dusty disused “saggars” or containers made of high temperature refractory materials, used to protect the “green” products from direct flames. It felt cool then but I could imagine the intense heat inside when it was fired-up. Having been dormant for more than 20 years, this derelict space was already home to spiders and other creepy-crawlies so I beat a hasty retreat from the insides of this old Dragon. Aw Pottery remained popular for creative landscaping designs and garden deco and die-hard fans still found their way to Macap for their regular ceramic fix. When the Plus Highway was opened, fewer drivers used the scenic route to Johor Baru. As North-South traffic gradually bypassed Air Hitam and Macap, Aw Pottery ceased to be a popular stopover on the tourist map. Recently when a friend asked me about Johor ceramic ware, my first thought was Aw Pottery! I gave him the contact telephone numbers to call but was later told that no-one was picking up his calls. Since it was just about an hour’s drive from Johor Baru to Macap, it didn’t take long for us to decide to go there to check them out. After the exit to Macap from the Plus Highway, I noticed that the old road looked different because new buildings seemed to over-shadow the older structures along that way. I recognized the two figures at the entrance to Aw Pottery and as I drew closer, my elation turned to disappointment because the front gate was shut and fastened by a huge padlock. I’m sad that my search seemed to have ended in failure and I had yet to receive any reply to the emails I sent to their American sales offices, enquiring about their factory in Macap. Without hesitation, I called that telephone number and was delighted when Ms Lim answered. I then learnt that while operations have been scaled down, the showroom and museum are still open from 8am to 5pm except on Thursday and Friday. I remembered my recent visit was on a Thursday and now knowing that they are still in operations, I’m already planning my next visit – this time, on days when they are opened. At a recent fruit fest, the organizers generously provided some 800kg of durian for guests to enjoy. The durian tasting session should start in half an hour but I saw a few die-hard durian fans stand near the fruit table and a queue suddenly formed behind them, snaking long and winding around the event area. 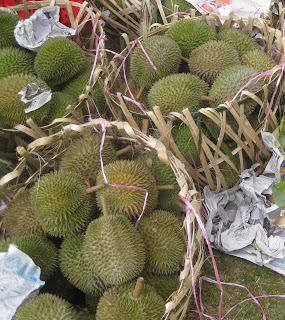 Once the D24, D2 and D13 durians were opened, they did not hesitate to pick up their share and could not resist going back again and again to help themselves to more of the plump yellow-fleshed durian seeds. I was appalled at such selfish behaviour and much relieved when a staff stopped them from jumping the queue and gently advised them to join the queue again for their next helping. After all, there was a queue of people who have yet to enjoy their first taste. It was disturbing that these seemingly educated, civilized and matured-looking people were driven to behave in such an uncouth manner because of their desire for more durians. At every season, it’s common for unscrupulous durian sellers to take advantage of durian lovers and I have heard tales of their greed to earn extra money through cheating by manipulating the weighing scales. Or by a sleight of hand, they can switch a bag of carefully chosen durians for rotten ones, so that by the time the customer discovers it at home, it would be too late or inconvenient to return the fruits. This often happens at make-shift stalls because they know that customers cannot find them again if they returned to that spot. One devious durian dealer may never forget that day when he used this trick on my Uncle Roland because uncle is not someone who takes such dishonesty lightly. 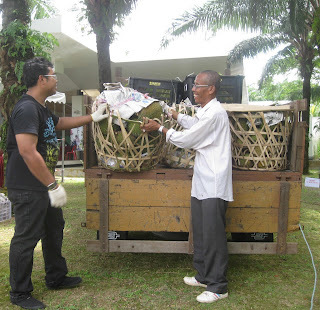 He was going from Johor Baru to visit relatives in Malacca and stopped along the way to buy some buah tangan but was greatly embarrassed because the durians turned out to be rotten. 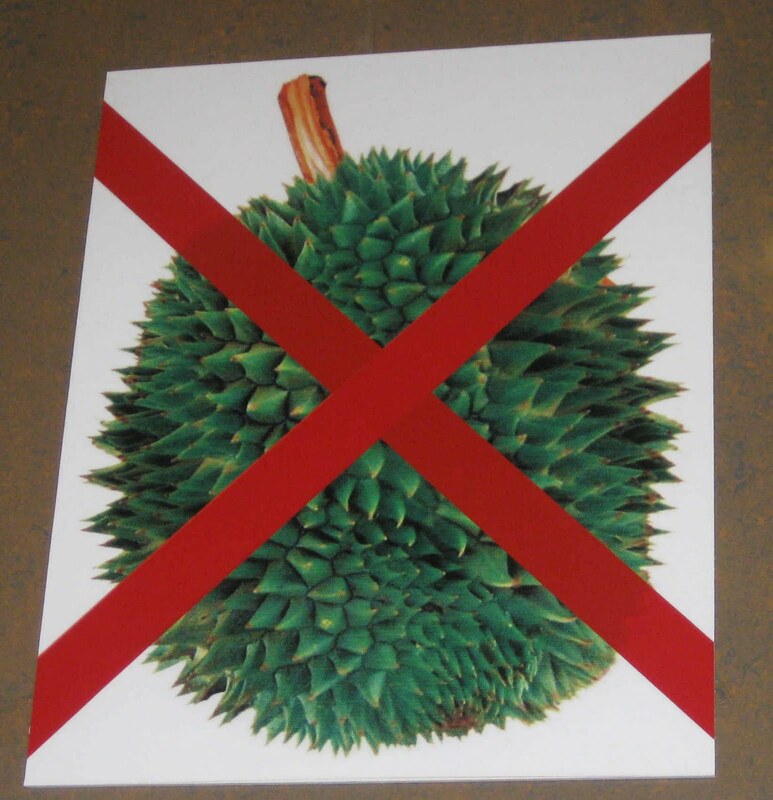 Now every season when we come across any dodgy looking durians, this incident is retold because we can never forget how uncle brought the rotten durians to track down the dishonest dealer and made him regret what he did. Another favourite family durian anecdote is about Uncle Arthur, who as a boy had the misfortune of being hit on his head by a falling durian. At that time, the family lived in an area around a pond in Johor Baru, close to what is now known as Jalan Quek Keng Kang, where there were many durian, chiku, rambutan and star-fruit trees. When it happened, uncle was of course, momentarily stunned but had no lasting injury because he’s a father of two and recently celebrated his 69th birthday. Uncle happens to have a healthy appetite for durian and my guess is it’s because he is eating with a vengeance. With the durian season in full swing, I’m receiving invitations to durian plantations for durian feasts, but my first question is, “Do you provide helmets?” They think I’m joking and just paranoid but I don’t fancy getting a thorny durian falling from a height on my head as it can cause serious damage. And I don’t have a head as resilient as my uncle’s. Durians - delightful or disgusting? Last week when the topic of durians came up in conversation, my friend Linda confessed that she and her husband can skip a meal and substitute it with durian. If there was any excess, it was packed and refrigerated, ready to be eaten for breakfast. Unlike them who have each other to share their durian craze, my Uncle Victor, the family’s durian king, ironically married a woman who doesn’t like fruits. Maybe it’s a good thing because when his children are not at home, he would bring his durians over to enjoy with us. The other night, Uncle Victor brought a stash of the choicest kampong durian to share with us and I observed how skillfully he opened the fruits and neatly split open every uneven wedge. When a wedge that had worms was opened, he proved to be a true connoisseur because he was fearless and even helped himself to the seeds in the same worm-ridden wedge. I thought a lesser durian enthusiast may just discard the worm-infested wedge but not Uncle Victor who truly knows how to appreciate good durian. Durian fans are aware of its warming properties so they counteract it with various remedies believed to help cool the body system. 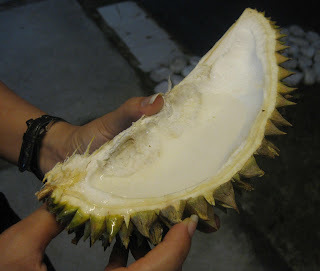 One way is to eat durian along with mangosteen which is supposed to contra off the durian’s heat effects. I was taught the traditional method of mixing salt water in an empty pod to drink and wash my hand. Amazingly this will not only remove the pungent smell from my hand and mouth but will also discourage any throat infection. 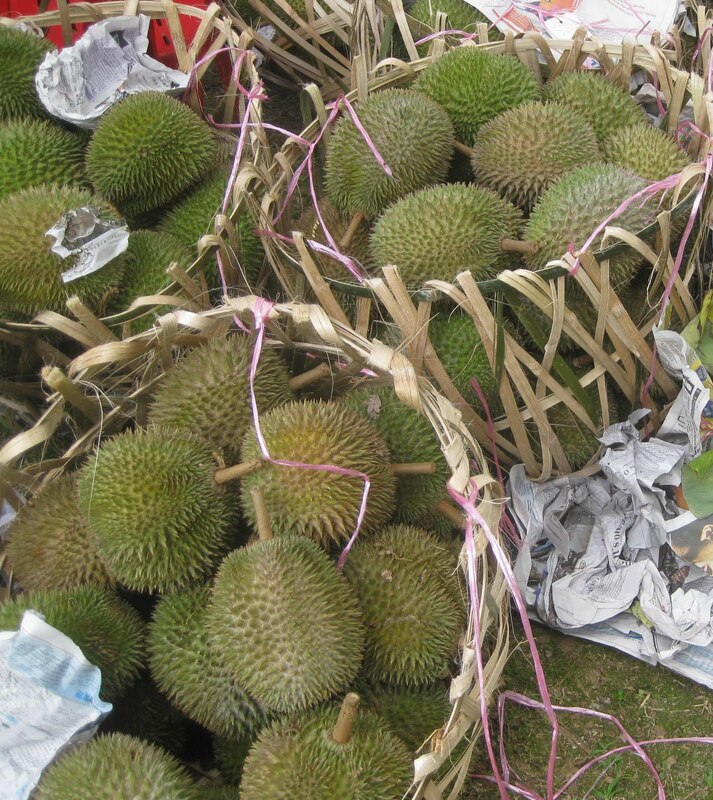 During the season, some fans will buy fresh durian and pack them in deep freeze so that it can be taken out, thawed and slowly savoured whenever there was a crave for its delectable custard-like taste. 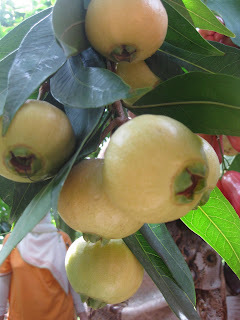 It’s interesting that once you get past the smell, there’s so much to enjoy and I take my hat off to foreigners with an adventurous palate who have acquired a taste for this fruit which is banned in many places because of its smell. It’s been described to smell like garbage, dead meat and dirty socks but love it or loathe it durian is clearly here to stay. “Hi Peggy, What a wonderful reflection of your early years in Jalan Ngee Heng – I too remember it well,” said Vincent in his email. He introduced himself as a reader whose grandparents, the Susay’s, used to live at No. 29, across the road from my Ah Kong or grandfather’s house at No. 154 Jalan Ngee Heng. 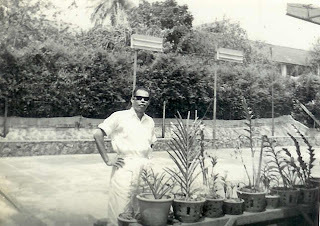 His family now lives in the UK but by reading my Johor stories on line, he connected easily with the nostalgia and reminisced with me about how his mum would tell him stories of the great badminton players who lived in that big bungalow. Vincent added, “I can also recall your area lit up by the outdoor fluorescent lights,” and I tried to imagine his view from across the road because I only saw the badminton court within our compound, behind the tall bamboo fence. At that time, street lamps were few so the brightly lit court could have stood out as a landmark on that end of Jalan Ngee Heng. However this court and Ah Kong’s house are now part of the highway and Wisma Maria was built on the site of the terrace houses where Vincent’s family used to live. 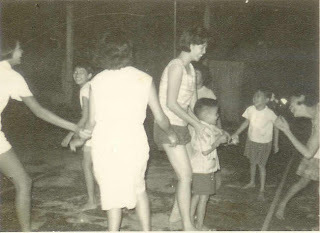 In those days every evening, we the children, had the first opportunity to play on the court before the badminton training started. Play time started after tea until dark because as a rule, the lights would only be switched on when badminton started and by then we should go in to shower before dinner. We played a variety of games that involved lots of running and racing and we often employed the lines of the badminton court as it was easy to set rules based on those lines. Our adults often joined us to play as a warming-up exercise and it was double the fun as teams were formed to play a thrilling game called, masuk belon or belon achar. The strategy was to prevent members of the opposing team to reach the top end of the court by blocking their way along several lines crosswise of the court. I can almost hear the way we used to scream in excitement and looking back now, I wonder if the tall bamboo fence helped to muffle the noise we made on that court. Apparently Vincent had not read my recent article on ice kacang, (“The first crush still melts the heart” Johor Streets, 9 August 2011) because it was on my experiences of this tropical treat made by the very shopkeeper at Jalan Ngee Heng. I certainly remember his shop, the nostalgic ice balls and how he used to whiz around on his scooter, delivering and collecting goods in a rectangular plastic basket strapped onto the scooter’s rear rack. I’m familiar with the scooter because my Ah Kong also used to ride a scooter, a Lambretta to be specific, and I fondly remember going out with him for joy rides. In those days, riders were not required to wear helmets as traffic was light and people drove at a safe and sedate speed. I was short enough to stand in the circle of Ah Kong’s out-stretched arms with my little palms firmly holding the handlebars and I can never forget the thrill of the wind whipping around me, turning my mop of hair into a tangled mess. 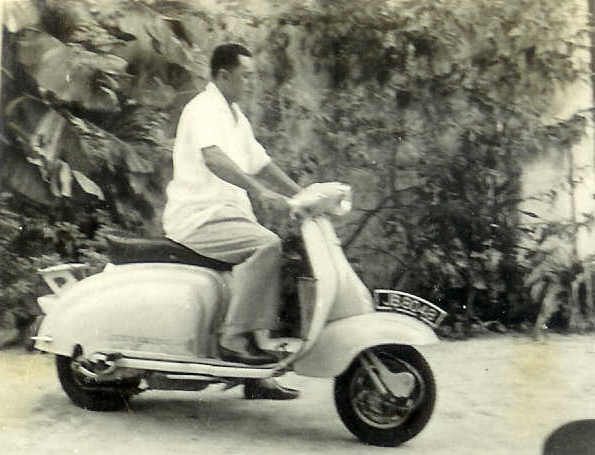 One incident involving Ah Kong’s scooter and the badminton court is indelibly engraved in our memories because Uncle Arthur tried to learn to ride there but with disastrous results. He probably thought that the court was a safe place to practice riding but he did not anticipate the danger as he was unfamiliar with the controls. At first it looked like fun as the scooter jolted around with stops and starts but we watched in horror when he lost control of the machine and suddenly shot ahead and crashed into a concrete wall. Uncle was not physically hurt but his pride was probably dented as was parts of the scooter and he had some serious explaining to do about the damage. 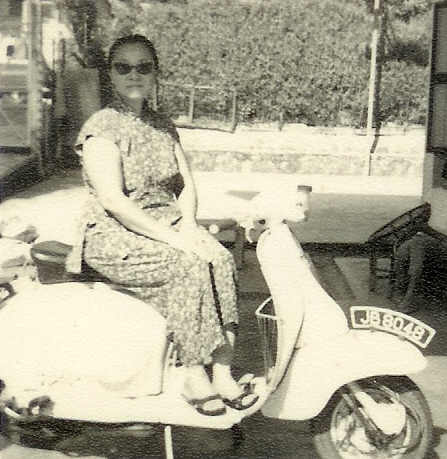 Thanks to Vincent, I can share more memories of Jalan Ngee Heng and reminisce about this vehicle which was a modest means of transport for Ah Kong who often took grandma downtown to Capitol or Broadway theatres to watch Teochew opera movies. We can only remember the good old days when there was a badminton court and bungalow at No.154 because if Vincent was to look for it now, that site is occupied by a huge advertising pylon and an overgrown tree that provides shade to a hawker stall that stands on our former driveway. Thank you very much for getting back to me after I posted my comment to your wonderful article. I can't believe it! Yes I am Vincent Alexander and I attended St Joseph's school from 1971 to 1975. Then the family moved to Butterworth and we came back to JB in 1979. I completed my studies in the Aminuddin Baki school. I do remember the D'Silva family as we used to go the the JB church for Sunday evening mass. I've now been living in England since 1985 and would love to catch up with any of the old church and St Joseph crowd. What a small world eh!!? Thanks once again for getting back to me and in my very humble view, you certainly have a gift in capturing on paper memories of days we thought long forgotten growing up in Ngee Heng. Do keep in touch.